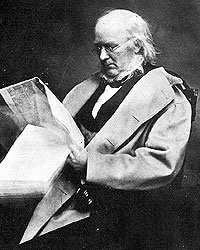 Horace Greeley was the Editor of the New York Tribune, which he founded in 1841 after earlier founding a weekly newspaper (The Jeffersonian) at the request of Thurlow Weed. 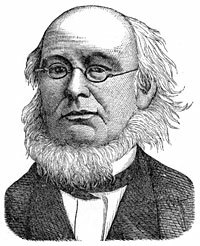 An eccentric social reformer and erratic political tactician, he pushed Illinois Republicans to back Stephen Douglas in 1858. Later during the Civil War, he alternately urged strong prosecution of the Union war effort and pursuit of peace negotiations. Although Greeley was an early New York ally of Weed and William Seward, he became their implacable foe and helped doom Seward’s presidential prospects in 1860. Greeley was passionate and impatient. 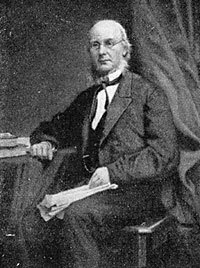 He was known as a strong opponent of slavery, a knowledgeable expert on the protective tariff, and a strong proponent of western expansion. Although Republican, he often differed with President Lincoln, sought an alternative candidate in 1864, and favored a compromise end to War. At one point in July 1864, Mr. Lincoln urged Greeley into personally conducting a peace mission to the Canadian border and was then embarrassed when the mission failed dismally. Mr. Lincoln told an August 1864 Cabinet meeting that Greeley was like an “old shoe—good for nothing now, whatever he has been.”6 Greeley visited the White House less than some other prominent Republican editors, but his correspondence to and from the President was very important in defining public policy on the war and emancipation. 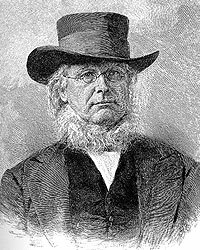 If the narrative of George G. Hoskins, an upstate New York politician who saw both men, is to be believed, the president set out to appease the editor in the one way that Greeley would surely find irresistible. Hoskins had been in to see Greeley and had found him generally out of sorts with Lincoln—so much so, in fact, that the editor had flatly declined a presidential invitation to come down to Washington for a talk. Then Hoskins went on to see Lincoln himself, hoping in some way to repair the breach. 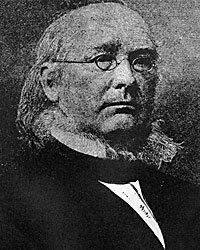 According to Hoskins’ account, the President took him by surprise and ‘began at once to express his lifelong admiration of Mr. Greeley, asserting..that he regarded him as the ablest editor in the United States, if not in the world, and believed that he exerted more influence in the country than any other man, not excepting the President.’ Then Lincoln proceeded to call Greeley ‘the equal if not the superior of Benjamin Franklin’—a remark which led the President to say that he had long had in mind offering to Greeley the very post which Benjamin Franklin had first held, namely that of Postmaster General. Hoskins, amazed by all this, asked the president whether he meant it seriously. Of course, said Lincoln; and he instructed Hoskins to go back and convey the Cabinet offer to Greeley in his name as a ‘solemn promise’ to be fulfilled after his reelection. “I will stake my life upon it,’ said Hoskins. Greeley served briefly in Congress in 1848, winning strong enmity from his colleagues as a result of the Tribune’s series exposing account padding—including that of Congressman Lincoln. 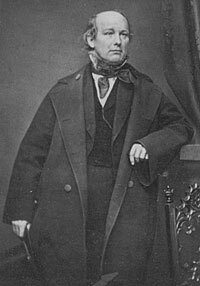 His failure to get a statewide Whig nomination in 1854 led to his split with Weed and Seward. In 1861, they secured the nomination of Ira Harris to the U.S. Senate over Greeley. After the war, Greeley was a co-signer for Jefferson Davis’s bail. Greeley lost the race for State Comptroller in 1869 before he was nominated for President against Ulysses S. Grant in 1872 as a Liberal Republican-Democrat. He lost the election, his newspaper job, his wife and his own life— all with a month of that election. In addition to his writing for newspapers and Whig Party periodicals, Greeley authored several books including Glances at Europe and The Civil War: The American Conflict. Lloyd A. Dunlap, “President Lincoln and Editor Greeley,” Abraham Lincoln Quarterly, June 1948, Volume V, No. 2, p. 100. Allen Thorndike Rice, editor, Reminiscences of Abraham Lincoln by Distinguished Men of His Time. Harry J. Maihafer, The General and the Journalists: Ulysses S. Grant, Horace Greeley, and Charles Dana, p. 129. Roy P. Basler, editor, Collected Works of Abraham Lincoln, Volume V, p. 169. Basler, editor, Collected Works of Abraham Lincoln, Volume V, pp. 388-389. Diary of Gideon Welles, Volume II, pp. 111-112. Douglas L. Wilson and Rodney O. Davis, editors, Herndon’s Informants, p. 164. Dunlap, “President Lincoln and Editor Greeley,” Abraham Lincoln Quarterly, June 1948, Volume V, No. 2, pp. 109-110. Maihafer, The General and the Journalists, p. 129. 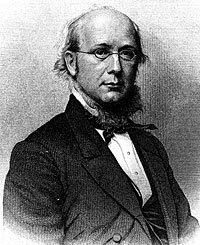 William Harlan Hale, Horace Greeley: Voice of the People, pp. 288-289. Dunlap, “President Lincoln and Editor Greeley,” Abraham Lincoln Quarterly, June 1948, Volume V, No. 2, pp. 97-98.